An aggressive move by Ryan Blaney led to a crash at the end of Stage 1 of the Daytona 500. The crash involved seven cars and knocked Jimmie Johnson and Daniel Suarez from the race. The stage racing was meant to make drivers more aggressive and that’s what NASCAR got. 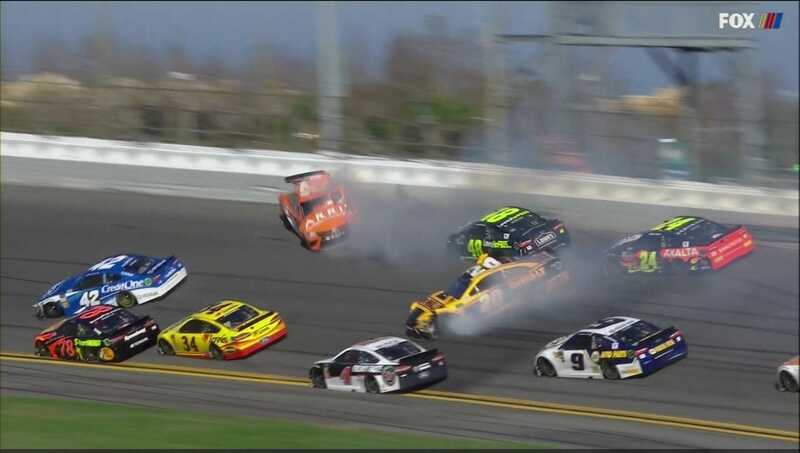 Seven-time NASCAR champ Jimmie Johnson and Daniel Suarez were among those involved in a wild wreck in Lap 60 as the Daytona 500 got off to a wild start. The crash came on the final lap of Stage 1 as Ryan Blaney, running third, made an aggressive move to pass Ricky Stenhouse Jr.
Stenhouse went to block Blaney and momentarily looked like he was going to lose control. While he was able to save his car, things piled behind him and sevon cars were involved in the chain reaction. 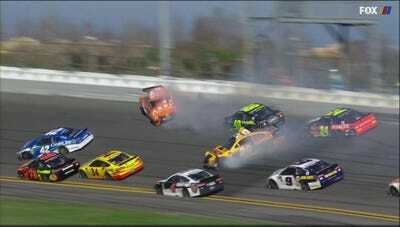 Johnson and Suarez, two popular picks to win the race, were knocked out of the race as a result of the crash, as were Ty Dillon and Erik Jones. In a bit of irony, stage racing was introduced for the 2017 season as a way to bring more interest to the races in the earlier laps. With playoff points on the line for being in first at the end of each stage, the hope was that drivers would be more agressive at those moments in the race. The moves made by Blaney and Stenhouse that caused the wreck behind them were moves that are typically only seen at the end of races. And sure enough, it was that agressiveness that knocked Johnson and Suarez from the Daytona 500 less than one-third of the way into the Super Bowl of stock car racing.